Removing grips might sound pretty difficult, but it's not. If you have some lemon furniture polish handy, it's a breeze. Simply spray on a small rod of any kind(a wheel spoke does a pretty good job) it will do. In the images, you see that I'm removing a grip from the outside. If your grip is capped at the end, simply insert your rod from the inside of the grip. Apply some on the handlebar to reinstall grips, it will dry with time and they will seize back in place(just don't put too much). 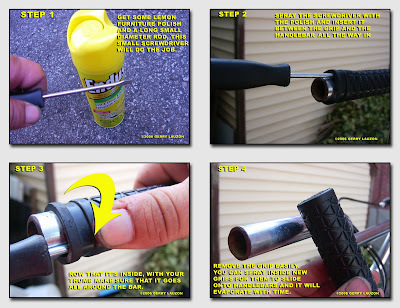 Lemon furniture polish can be used to clean your bike. Yes it does a great job of everyday cleaning, you'll find that dirt has a harder time to stick to it, it will revive the finish and it will smell great too! Just spray the frame, wipe the dirt off with a clean rag and buff it with another clean soft rag. Any furniture polish will do, as long as it is with lemon. Why you may ask? Another great thing about the stuff, this is where the lemon part is important, is that it can degrease just about anything. I've managed to remove caked on grease on old chainrings without any problems at all. Just make sure you keep the stuff away from your chain, rims and bearings when you clean your bike with it. Watch for a complete BMX rebuild article coming this week. Until then, ride safe. To reapply your grips hairspray is a much better low tack option. If you have an air compressor, a burst of air usually does the trick nicely also. Jus kiding, your blog rocks! I used to use a spoon handle and some spit/water, depending on whether it was an emergency repair or not. I always carry a spoon. Good for tires, too. One thing about replacing the grips. I usually ride single speed with coaster brakes, and my grips usually are there until they are toast. To keep them from spinning or sliding off, I apply then with some clear silicone. They are there for the long haul, and unaffected by water. Just cut them off. That would definitely do the trick if you want them on for a more permanent stay. Reinstall grips using a tiny amount of dish soap. They'll slide on real easy and will stay put after the dish soap has time to dry up. I didn't have any special supplies, rubbing alcohol or sprays, not even an air compressor. The easiest lowest tech solution is to slide a spoon handle with a drop of dish soap on it as deep under the grips as I can. Rotating them back and forth a few times releases them. Worked just as described! Thanks! Before buying any power tools you have to careful where you use it. Then you have to know the pops and corns of the tools. Find best air compressor with the comprehensive best air compressor guide.